A LINE ON THE LANDSCAPE: Travel with “Michael” from Italy to Ireland. The Roman World Survey and its aftermath. The known world was being mapped by early cartographers. At the climax of Rome’s Empire did a world map of quality exist? When the institutions of the Early Christian church were established in Rome, they had access to the knowledge of the Roman state (plus of course the previous Greek states [Aujac 1987]),were largely peopled by educated Romans and could, as will be shown, use Roman methodology. Thus, I will argue, both cartography and religious knowledge coalesce to form a surprising landscape feature. BASIC KNOWLEDGE; WHO WAS “MICHAEL”? The earliest writings concerning Michael are from the Jewish/Hebrew texts. M. Sel’s entry in The Jewish Encyclopaedia traces references in ancient writings and generally considers that the origins are Babylonian (Sel 1905:535-538). Michael, the Archangel and messenger of God has the following interpretation normally placed upon his name; it is a phrase, ‘WHO IS LIKE TO HIM (i.e. God)’, and it is said that when something requiring wondrous powers is to be done, Michael is sent. Thus we read in the Bible the epithets, ‘chief of the heavenly hosts’; ‘Angel of the Lord’, etc., and can surmise that the ‘war like angel’ perceived by Joshua near Jericho was none other than the Archangel Michael. As for Christian Saint Michael, there are a plethora of books but the standard reference work is the multi volume ”Millénaire monastique du Mont Saint Michel”, published by P. Lethellieux, Paris (1966-2001), so far comprising five volumes containing works by many authors covering history, archaeology, cult, and myth. However there is no mention of surveying or mapping. The geographical knowledge of the ancient world is described in The History of Cartography, Volume 1, in which geographical mapping in the Roman imperial period is discussed by O. A. W. Dilke (1987). In chapter 12, O. A. W. Dilke writes the following; “An even more potent force in the development of Roman cartography was, however, geopolitical. There can be little doubt that by the late Republican period Roman rulers and their advisers had come to recognise the value of geographical maps in both administration and propaganda. In particular, it is in this light that the truly imperial scheme initiated by Julius Caesar (100-44 BC) – to undertake a survey of the known world- can be interpreted.” After another chapter, the next states the conclusions regarding the cartography of the ancient world. The two texts from late antiquity, both probably written in the late fourth century or early fifth century AD, provide the earliest extant account of Julius Caesar’s survey of the world. The first is in the geographical treatise of ‘Julius Honorius the orator’ and the second, rather longer, is in the Cosmography of an author conventionally known as ‘Aethicus’but in fact anonymous. These two texts were well known in the following centuries and are a feature of the Ebstorf, Hereford and Cornwall mappaemundi. Fortunately the question which requires to be posited at this juncture already exists in print, plus three definitive reasons for acceptance of the answer. In his paper Wiseman (1992:33) poses the question, Can we believe the testimony of Julius Honorius and ‘Aethicus’ on the world survey of Julius Caesar? He then continues, I think there are three prima facie reasons to answer “yes”. “First, the names of the surveyors, Nicodoxus, Didymus, Theodotus and Polyclitus do not sound like late-antique inventions, and learned geographers in the first century BC would naturally be men of Greek origin and culture. [A recently discovered inscription reveals a ‘land-measurer’, geometres, making a dedication to Augustus at a town in Thessaly: unfortunately, the name is missing.] It is even possible that one of the four can be identified. A Didymus who wrote on measurements in Alexandria, the intellectual capital of the Hellenistic world, has been plausibly dated to the second half of the first century BC”. Hence we can assume that Julius Caesar’s four commissioner’s report, the latest in 18 BC, and Augustus, Caesar’s adopted son, now Rome’s emperor while expanding the empire requires the world map. Marcus Agrippa was entrusted with the project, but, given the preceding activity, he was only required to update the work of those commissioners. Indeed, according to R. K. Sherk (1974: 559, n. 80),’It was the conclusion of Klotz . . . that, although Agrippa had taken over much from Eratosthenes, he was a vir vere Romanus and accordingly gave a very high priority to Roman sources in the preparation of his map’. In fact, Agrippa’s task, continued by Vipsania Polla his sister, was actually completed by Augustus, as described in Plinythe Elder’s Natural History (3.16-17, 6.139). 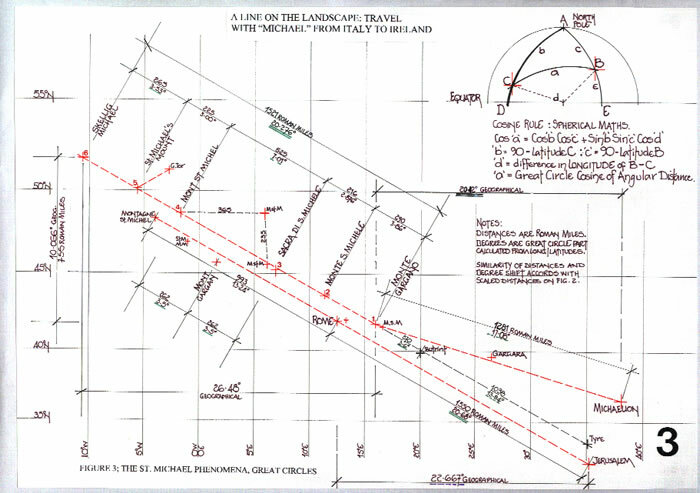 A glance at the Tabula Peutingeriana (Ferrar 2005) shows that all road distances between settlements were measured. With even a crude representation of the land form of a country, with those distances appended it would provide the basis of a survey map and possibly a more general map in the form of a mappa mundi. We can therefore hypothesize that maps and data were available to scholars or learned persons until the collapse of Rome. A study of Roman surveying works in Britannia argues that from the positioning of their forts the Romans would have known that one degree of latitude was 75 Roman Miles and established the World dimension of 360 x 75 = 27,000 Roman miles, or 216,000 stades (Ferrar and Richardson 2003). This information may have been transmitted to Claudius Ptolemy circa AD150 to enable his placing of Deva [Chester], Isca [Exeter} and Eburacum [York] with their Legionary contingents, and other sites, named on his maps. [See Stm1D01 for comparisons.] Therefore, even if we only accept that the maps of Marinus of Tyre and Claudius Ptolemy were available between c.AD100 and c.AD300, this coincides with the crucial period within the Roman state when Christianity developed. Thus there is sufficient circumstantial evidence to conclude that there was a Roman Mappa Mundi; it was available in Rome circa AD 23-79 when Pliny the Elder was alive, and probably existed for centuries after. The city of Rome existed until AD476, when it was sacked by Odoacer and in effect the Western Roman Empire ceased to exist. Thus for some four hundred years its existence and usage is quite probable. But the Church did much more than just use Roman measures. Legends of apparitions of the Angel are well documented, with the first being at Monte Gargano in Apulia, Italy. In the city of Sipontum, cAD490, a man named Garganus grazed his herd on the side of “His” mountain, when a Bull separated itself from the herd and climbed to the mountain top. A search revealed the Bull standing in the mouth of a cave. Garganus, annoyed with the Bull, aimed a poison arrow at it, but, the wind turned the arrow about, and it returned to hit Garganus! The local people asked the Bishop for an explanation, who on visiting the cave then fasted for three days and received a visitation from the Archangel Michael. The significance of this story is two fold; it links Michael with high places, and hidden in the story is the simple fact that the arrows flight depicts an alignment, a straight line, there and back (De Santillana and Von Dechend 1969, chapter 5, A guide for the perplexed). The second apparition supposedly took place in Rome during the papacy of Gregory, cAD590, who whilst praying for salvation from the plague raging in the city, saw the Angel of the Lord wiping a bloody sword and returning it to its sheath. The plague was stayed! In honour of the event, he built a church above the castle of the apparition that is now called Castel Sant’Angelo, Rome, or ‘Castle of the Holy Angel’. In cAD710, the Archangel Michael supposedly appears for a third time, to the Bishop of Avranches in Normandy, France, at a place “in peril of the sea”, called Mons Tumba. The Bishop is instructed to build a church on the aforesaid Mount, as at Monte Gargano, Italy. The Bishop had doubts concerning the size of the church to be built, but finding a Bull hidden in a cave was ‘told’ to build to the circle of the Bulls hoof prints in the soil around the cave. This church is of course the magnificent edifice of Mont St. Michel. The motif of the arrow recurs when the nuns of the church sell “arrows” to sailors to placate the winds and seas for safe voyage. The arrow of course symbolises the direction of safe sailing and the motif used by the scribes to delineate lines on the diagrams for measurements, as is indicated in the cartulary of Mont St. Michel, Ms 235, Recueil de Traites Scientifiques, Fo.33, La mesure du carre de l’hypotenuse. But, why should St. Michael and arrows affect sailing? Simply put, because Michael in Hebrew of the Talmud is the Saint of Water. The Jewish Encyclopaedia indicates the following; Michael is the Prince of Snow, element water; Angel of Silver; Planet, Mercury; Day, Wednesday and Michael also equates to Saturn, Saturday and the South wind. This is probably the basis of the’Haggadah’ that when Solomon married Pharaoh’s daughter, Michael drove into the bed of the sea a stick around which slime gathered and on which later, Rome was built (Sel 1905: 538). I suggest the links are as follows; St Michael is associated with high places, arrows are straight lines; high points are for surveyors, and the Bull indicates a circle, with the whole an encapsulation of Babylonian/Persian/Egyptian/Greek/Jewish religious practices; a melange of the whole religious history. Add to this Romano/Greek technology, and? We have discussed three supposed apparitions of St Michael. But, in the landscape of Europe, St Michael is used to name many high mounts. And, in this landscape a curious phenomenon arises, lines of history are drawn. 2) The second point is Monte San Michele, Italy, 43.55N/11.38E, 892 metres high. It is north of Siena in the Monti del Chianti. It is surrounded by places called San Michele and the intriguing legend of S. Galgano at Chiusdino and S. Michele on the Monti Siepi. These are Tuscan legends at their very best, and require a book for explanation (Dell’Era 1986). 3) The third point is the Sacra di San Michele, 45.10N/7.34E, on a peak west of Turino, Piedmont, Italy. The Abbey of San Michele, near the old town of Avigliana, was built on the peak of Monte Pirchiriano in the 11th Century. 4) The fourth point is the world renowned, and previously discussed site of Mont St. Michel, Normandy, France. Set on a rocky outcrop, Mons Tumba, in Avranches Bay, it has expanded since its inception c.AD710, to the most spectacular site and view for a church available today. Mons Tumba, in periculo Maris! Geographically it is at 48.67N/1.5W. In France there are two further Mt St Michel’s, one east of our original site, geographically at 48.68N/5.88E, or 365 Roman miles east, and the second that may be considered part of the alignment is marginally south of the putative line, and just west of our third point , geographically 45.55N/6.08E. 5) The fifth point is similar, but also so very different; it is smaller. But, St. Michael’sMount, Cornwall, now sitting in a bay that has flooded over the millennia thus changing the site from a “Mount” originally known as Hore-rok in the wodd to an island. The geographical location is 50.166N/5.5W. 6) The sixth point is a spectacular sheer sea mount, shaped like a perfect pinnacle rising out of the waters of south west Ireland. The Skellig rocks, and particularly Skellig Michael, became a haven for monks around AD600, but it was in all probability abandoned in the 13th century (Moorehouse 1997). Geographically it is 51.766N/10.5W. 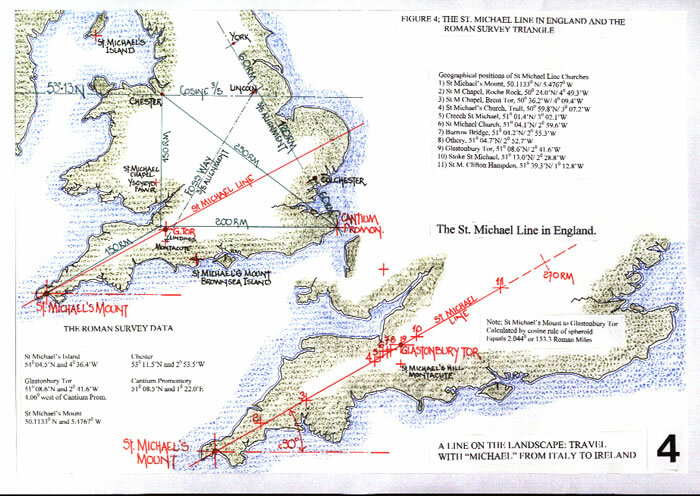 The second alignment indicated on figure Stm1D03 is from Jerusalem via Rome to Montagne St Michel, and the third line shown on figure Stm1D04, indicates the alignment phenomenon in England (at an angle of c. 30 degrees) from St. Michael’s Mount north-easterly through Glastonbury Tor with St. Michael’s Church atop. So far we have ignored the geographical origins of the St Michael line in Babylonia or the Middle East. The alignment when projected south-easterly passes through Butrint, just misses the islands of Rhodes and Cyprus and thence to Tyre. The alignment then parallels the S W border of modern Iraq. This area was not part of the Roman Empire and thus it is unlikely it was properly included upon the Roman mappa mundi. However, Roman Syria, between the northern reaches of the Euphrates and the Mediterranean was. In this area is the Michaelion (sanctuary of Michael) at Huarte/Haouarteh on Mount Diokleion in the territory of Apamea, (Canivet and Canivet 1987), geographically 36.40E/35.45N. Apamea is in the upper valley of the Orontes River on the Roman road from Damascus and Emesa (Homs) to Antioch and the Mediterranean and claims Aristarchus, one of the ‘seventy apostles’ mentioned in the Acts of the Apostles (19;29, 20;4, 27;20 and Paul’s letters (Colossians 4;10 and Philemon 1;240, as its first bishop. The Michaelion is in fact c.20.42 degrees east of Monte Gargano, but if we calculate using the meridional great circle of 40,009KM or 111.136KM per degree the distance is 1281 Roman Miles or 4.75 x 270 Roman Miles, a mere 69 Roman Miles short of a perfect 5 x 270 or 1350 Roman miles and as such marks perhaps a raison d’etre for the spacing identified upon figure 2. That it does not form part of a St Michael Line is probably due to the split within the Latin Catholic West and Greek Orthodox East that developed in the early Middle Ages. Thus we may speculate that the Christian scholars of the Latin west, who studied the texts of the Roman Agrimensors and the mapmaker Claudius Ptolemy and had the Roman mappa mundi for guidance, would only utilize points that were in their own sphere. Therefore, whilst we can construct an alignment within the Roman World, i.e., from Palestina/Arabia to Britannia [and Hibernia], as the diagrams indicate, the only patriarchate of the Latin world, Rome, no doubt thought of only Italy and the west. DID THE CHURCH PRACTICE LANDSCAPE ALIGNMENT? Along the south coast of Britain there is but one large island, Vectis Insula, Isle ofWight. It is mentioned many times by the Venerable Bede in his History (Ferrar 2005). 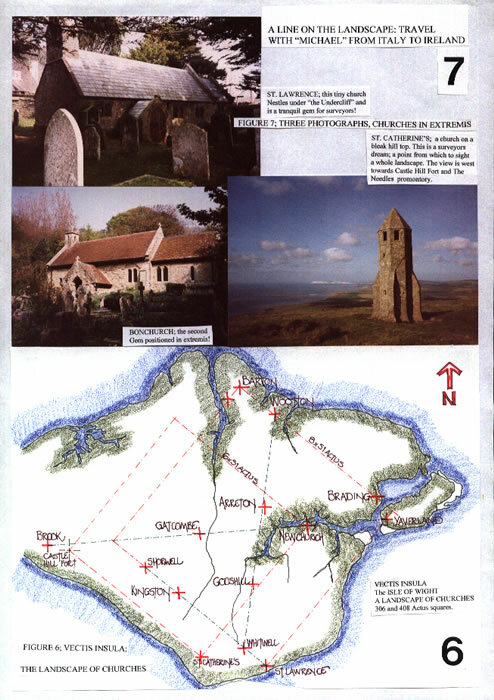 Figures Stm1D05 and Stm1D06 illustrate the Isle on which exist 37 Church sites (Winter and Winter 1987), varying in date from the 7th century to the 13th century. The churches also vary in size from single cell Saxon to enlarged Norman edificies. Photographs included as figure Stm1D07 illustrate three of these. But, what is so striking about these Churches is their landscape positioning, as it accords with a putative Roman Survey which was undertaken following the invasion of AD43 (Ferrar and Richardson 2003). Two of the putative survey lines appear to have been mimicked by the alignments of early Churches. These are alignments of four Churches, (not three which is easy to achieve), and they are geometrically and metrologically correct in both parallel and perpendicular alignment forming two squares in the landscape. They are set out in the landscape using the Roman measure of the actus, of 120 pedes, or 116.471 Feet. That the Church was capable of surveying/map reading is also illustrated by the metrology of their edificies. 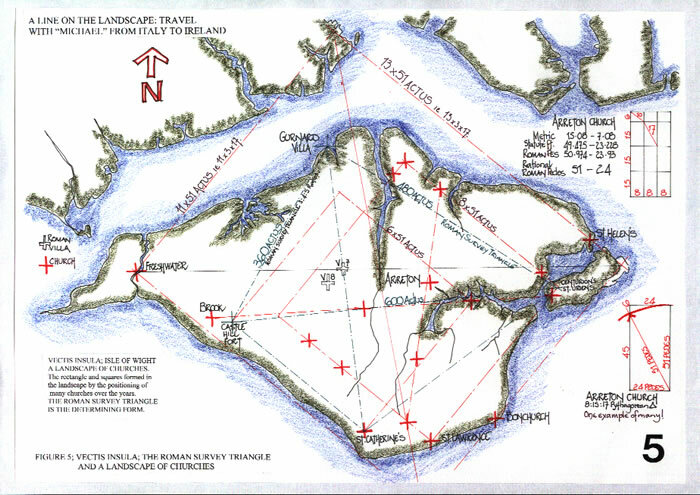 A study of the built dimensions for these Isle of Wight and other Churches of the early period indicates that the Roman pes was the standard unit and that the survey setting out techniques of the Roman land surveyors was utilised. The above is but one example of many such alignments which have been noted as existing in a variety of European countries, with some extending to 8 churches. This phenomenon is also found within the landscape positioning of monastic establishments in England (Ferrar and Kelly 1998). Building upon the work of the Greeks and their three centuries of mapmaking, the Romans, particularly their highly trained Geometers, Agrimensors and Surveyors were able to produce reasonably accurate maps of the Empire. These maps were extant as the Christian Church grew and became the crucible of knowledge in a world that was fragmenting and changing, sometimes for the worse. The pursuit of knowledge, even learning by rote in the early churches and monasteries, gave an impetus to the use of that knowledge. There was in Britannia in the 7th century a Cosmographorum codex mirandi operis, or ‘bookof the cosmographers of wonderfulworkmanship’ (Bede, Lives of the Abbots of Jarrow-Monkwearmouth 516), which was probably obtained in Rome by Benedict Biscop, founder of Jarrow monastery. This book would surely have been read and utilised, having cost the later owners eight hides of land, an enormous sum in those days. Add also the fact that the earliest church members had knowledge of the Roman surveyors, is it surprising that the use of that knowledge and the positioning of churches in the landscape according to ‘observed techniques’ would have had a cachet for the Church, and thus a power base. If the church could show that it was the successor to the Roman imperial state, it could utilise its power base. Hence even at the end of the first millennium we see major churches and abbeys of France built to Roman measures. As the Church grew, knowledge grew with it, and for a while it became the most powerful force in Europe. For this region Christianity represented the seat and fount of knowledge in the first millennium. The physical works in the landscape are a testament to that fact. M J Ferrar December 2007. Dell’Era, I. (1986) Leggende Toscane. L. Pugliese, Firenze, Italy. De Santillana, G. and Von Dechend, H. (1969) Hamlet’s Mill. Godine, Boston, USA. Ferrar M. J. (in preparation): A Landscape of Churches. Isle of Wight Natural History and Archaeological Society. WITH SINCERE THANKS TO Dr. R. W. B. SALWAY, SCEPTICAL, BUT ALWAYS READY TO ASSIST. 1. 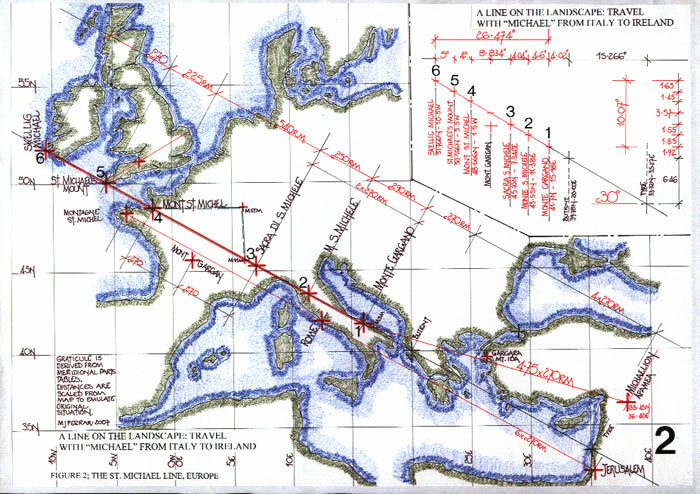 The maps, “The St Michael Line, Europe”, were drawn by the author using the Meridional Parts for the spheroid. The coastline is a freehand interpretation from a Mercator projection. The original is AO, 1189 x 841mm. Distances were scaled from the map to emulate the original methodology of the perpetrators of the alignment; they could only have taken the given or scaled distances. The calculated distances on figure 3 are based upon the Cosine rule for a spheroid as indicated and serve to illustrate the accuracy which could have been obtained. Comparisons made between the two must consider the relative size of the maps available c. AD100-300 and thus the perceived rather than the exact distance we can calculate so readily. 2. The Isle of Wight maps were researched on the OS 1:10,560 series and drawn originally on the 1:25,000 series OS map base, which is itself AO size. The actual figures used are freehand interpretations. Distances are calculated from the O S co-ordinates to three decimals. 3. All other maps are freehand interpretations by the author. Photographs are by the author. 4. 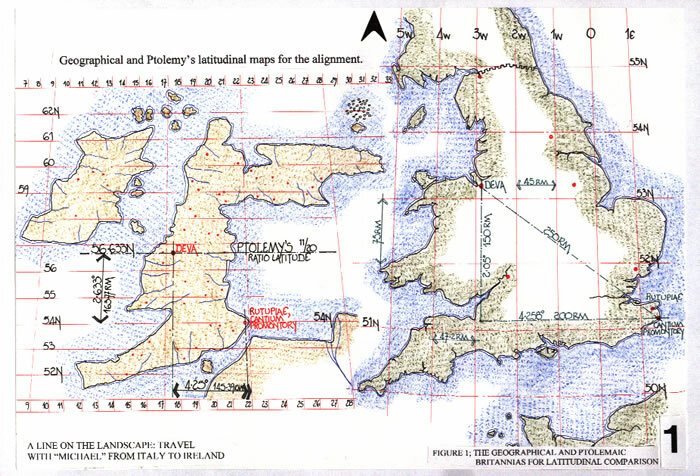 The maps of Claudius Ptolemy regarding Britannia and the Mediterranean are the subject of other research, and indicate the extent of Roman surveying and mapping skills.